Roman's note on her last year, 2008-2009. In September of 2008, about one month after the release of our Upsidedown Book, Alice underwent surgery for a hip replacement. Her condition turned critical and for two weeks she endured life threatening conditions. She was released from critical care with physical handicaps that required 24 hour nursing home care. She lived her last year under the care of Mt Olivet's Careview home in Minneapolis. I visited her daily and continued to consult her on plans & projects up until the last days of her life. Those who know Alice will appreciate that she retained her wonderful personality even as she endured cognitive difficulties with encephalopathy and physical handicaps that limited what she could do for herself. From her wheelchair at Mt Olivet she continued to reach out to help others and remained a strong determined trooper up to the very end of her life on December 7th, 2009. Alice Wagstaff Verostko, known by Kentucky friends as "Alice Ken" (née Alice Kennedy Wagstaff), daughter and only child of Joseph and Alice Kennedy Wagstaff, was born in Louisville, Kentucky on March 27, 1919 and died at Mt Olivet Careview Home in Minneapolis on December 7th, 2009. Without children she is survived by her husband Roman Joseph Verostko, known also as Joseph Victor Verostko, who continues to live in their Diamond Lake neighborhood home in Minneapolis where he also has his studio. Alice, a clinical Psychotherapist and educator was also Director of her husband's studio from 1968 up until the last months of her life in 2009. 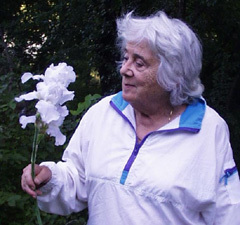 Her personality coupled with her experiences in childhood and the challenges she met at the University of Chicago gave her an unusual ability to work with people and easily be at home in both the scientific and artistic communities of her mature life. Above, 1941: Alice 6 months before Pearl Harbor, Louisville. Right, 1972: Alice, 4th wedding anniversary, Minneapolis. Photo by Roman in their home garden by Diamond Lake. Growing up, Louisville, Kentucky. Alice grew up in Louisville during the depression and learned how to be resourceful at an early age. 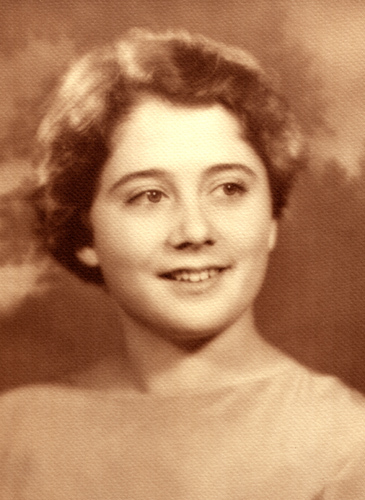 Following graduation from Holy Rosary Academy in 1937 she received a scholarship to attend Spalding University that was known then as Nazareth College. Following graduation in 1941 she taught school for a year. 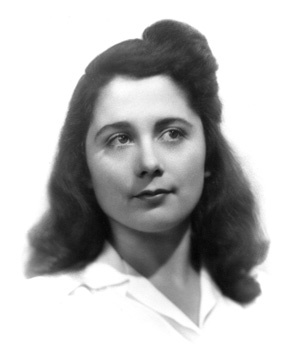 The war effort (WWII) led her to be the first woman to ever run the "stills" at Seagram. After the War night classes supported by Seagrams opened new horizons in both the arts & sciences. She was drawn to the University of Chicago where she was introduced to a new world of ideas and possibilities. Chicago & Pittsburg. During her graduate studies at the University of Chicago she served as a teaching assistant, intern, counselor, and research associate under Carl Rogers (1902 - 1987). Those years, 1953-60, under the influence of Rogers, marked a phenomenal growth in client centered therapy. By 1960 her experience as a therapist and Research Associate earned her an invitation to the faculty at Duquesne University in Pittsburg. 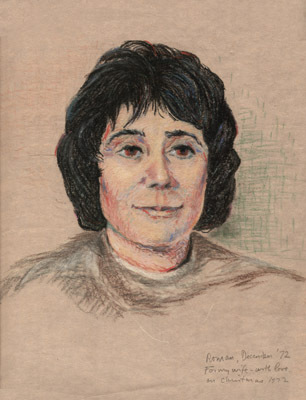 As Chairman of the Department of Psychology from 1962 to 1967 she participated in establishing a unique program in existential psychology. She participated in leading workshops nationally with the Institute of Man and laid the foundation for a counseling center at Duquesne University that served as a model for others. Minneapolis. After we were married in 1968 we moved to Minneapolis where Alice taught at the University of Minnesota before taking a position as a senior clinical psychologist at the Ramsey County Mental Health Clinic where she served for 18 years (1971-1989). She also conducted graduate seminars for five years at the Minnesota School for Professional Psychology. Following her retirement from Ramsey she continued a private practice at her home office until 2003. In addition she was active with the Minnesota Sandplay Therapy Group, and served on its board of directors. Her interest in educating women led her to serve in various roles with the Minneapolis branch of the American Association of University Women. She served on the scholarship committee and was especially proud of their scholarship program for young women. Alice at Ars Electronica as part of my exhbition, Linz, 2003. Alice demonstrates how brush strokes were created and executed for our limited edition of George Boole's derivation of the laws. PATHWAY STUDIO. From 1968 to the end of her life Alice played an active role in my studio as Studio Director. During the 1970's our shared interest in collaborative creative work led us to several projects as "Life Design Associates". This included an original installation, "Spring Ritual", for Steve Joy's Trajectory Gallery in London, Ontario (Canada). Alice joined me in taking a course in Fortran at the Control Data Institute and took an active interest in my algorist work. She helped create and build the word dictionaries that I used for the "Sayings of Omphalos" in the "Magic Hand of Chance" (1982-84). Her knowledge of language and structure as well as her natural bent for word-play and alliteration contributed immensely to the quality of the "Sayings of Omphalos". 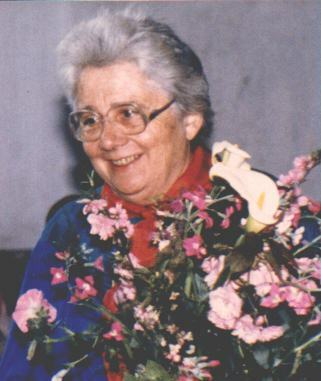 In 1989-90 she assisted in executing the 125 original front and end-pieces for the limited edition of the excerpt from George Boole's Derivation of the Laws...". 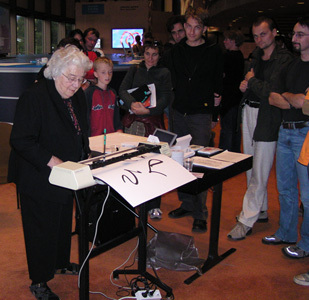 Serving as Program Coordinator, Alice made important contributions to the organization and implementation of the Fourth International Symposium on Electronic Art (1993). In 2008 I resurrected my drawings for WIM: the Upsidedown Book, a book we created in the early 1970's. The Upsidedown Book was a joint project created in the 1970's with Alice as "wordsmith". She forged the imaginary words for this book that can be read from either direction with its upside being also its downside or vice versa. The book's front side is also its back side and vice versa. This book was resurrected, revised and published in 2008 for the dedication of the Fred Rogers Center. With the help of Alice's critical eye I improvised the scale and composition of the book drawings for a two storey installation, WIM: the Upsidedown Mural for the Fred Rogers Early Childhood Learning Center at St. Vincent College, Latrobe , Latrobe, PA. This 2008 project brought us full circle to the place where we had met forty years earlier. Both the book and the mural stand as a tribute to her profound influence, not only on my life and work, but also on the life of so many others. See WIM: The Upsidedown Book and Mural. Below: Cabinet of figures used in sandplay therapy. (click image for larger views). 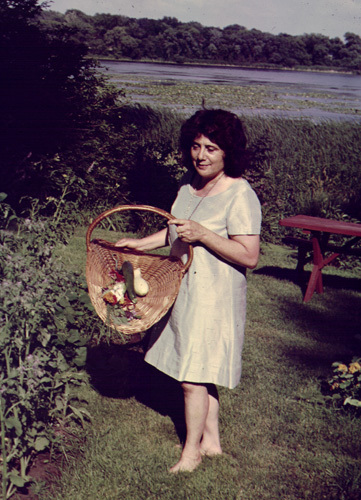 Sandplay Therapy became a part of her therapy approach in her home practice around the time of her retirement. 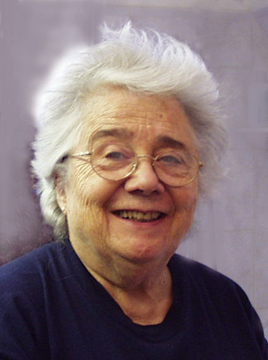 This approach grew out of the Jungian tradition through Dora Kallf, its founder. Although Jungian in its roots this practice is compatible with Alice's early training in client-centered therapy with Carl Rogers. This procedure may be used within a therapeutic session when the context and circumstance are judged appropriate by the therapist. In this method clients may be invited to create a composition in either wet or dry sand. Choosing from an array of miniatures, as shown in the cabinet above, they compose a picture, or show a hope, a fear, a dream, that is anything that they choose. In this non-verbal modality, the clients bring forth material, which they can discuss, elaborate, or take away via a picture for their own quiet thought. the spirit moves. Image and graphics by Roman.